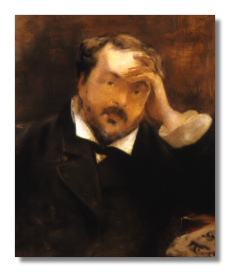 Intended by his parents for a more conventional career than that of a musician, the French composer Emmanuel Chabrier (January 8, 1841 - September 13, 1894) was employed in the Ministry of the Interior in Paris beginning in 1861, only devoting himself fully to music in 1880. His compositions include some colourful orchestral compositions and piano music that had a marked influence on his immediate successors. Chabrier's most popular composition is his Spanish rhapsody España. To this one may add the occasional Joyeuse marche and his Suite pastorale, an arrangement of some of his own piano pieces. The ten Pieces pittoresques, some of which were orchestrated by Chabrier in his Suite pastorale, are inventive in harmony and melody and attractive in form. They range from a simple landscape, Paysage, to a Menuet pompeux and a final Scherzo-valse.